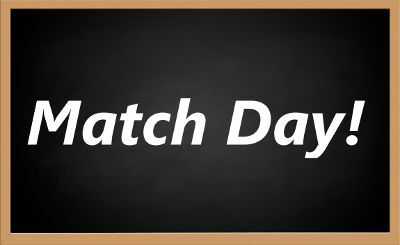 You are here: Home / Matching Program / Match Day – A day you’ll never forget! The VIRMP Match day is dreaded and feared by many. And for good reason – if you don’t match, what do you do?! Keep reading to see what you can do if this, unfortunately, is you. This day dictates where your next adventure lies, and for those who don’t match, it’s the beginning of a long and stressful day trying to secure a position for the year to come. In some cases, this process can drag on, as sometimes there are positions that open long after the Match is set and done. This usually have to do with funding or when other candidates drop out from their matched positions. We have a full chapter dedicated to Match Day in our eBook How to Navigate the Veterinary Matching Program. It contains everything you’d want and need to know about the VIRMP matching program. Check it out! So, did you match or not? Be ready to get frustrated trying to log in. There are always many people trying to log in at the exact time the results are posted and it’s possible you’ll have to wait a few minutes to find out. I had to wait about 30 minutes before I was able to log in the first year I applied for residencies! If you are one of the lucky ones, you don’t really have much to do other than be happy you got matched, even if the position was not one of your top choices. It’s common for people to be disappointed with the program they matched with because everyone wants their first choice, right? And while there are few candidates that get their first choice, the vast majority don’t. And that’s totally ok since there are so many fantastic training programs out there where you’ll learn a lot! Now that you can finally breathe, go out and have a nice dinner and drinks at the end of the day to celebrate! S#*%!!! I didn’t match!!! What now?! If this is you, you have to be prepared and ready for action. The game is still on!! There will be both unmatched candidates and programs with open positions. If you’re applying to internships, there will be a fair number of open positions you could still get! On the other hand, residencies usually have few to no open positions. You absolutely want to forget about the people that matched and how happy they are. Don’t get distracted by them. Easier said than done, but you really want to focus here – you have nothing to lose, so you better do all you can to try and secure one of the open positions. This process is usually called “the scramble” or “scrambling”. Ready?? How do people/programs know that I didn’t match? I don’t want to miss out! Every program that has open positions will receive the applications from unmatched candidates. Conversely, you will be able to see positions that are open by following a link on the VIRMP homepage. What can you do to increase your chances of scrambling into a position? – Actively browse the open positions list (follow the link in the VIRMP homepage after logging in). – Read the program descriptions for the open positions and decide if you’re interested in any of them. Remember that at this point you’re deciding if you’re willing to take a position at a less than ideal program (since you likely didn’t apply there originally), or trying again next year. These are hard decisions to make and you usually have a short time to make it. – Keep your phone with you and check your email frequently. – Have a good attitude and reply to emails/phone calls promptly. – Get advice from your mentors; they may have connections with some of the unmatched programs and can help you out! – Keep your partner/family in the loop and make decisions together. I’m going to repeat myself here: everyone is trying to fill or obtain a position! If a candidate says no to a program at this stage, the program director simply moves on to the next person. It’s ok to ask for some time to think about it, but don’t go over the agreed timeframe (they’ll often give you a deadline). If you don’t secure a position during the scramble, you should know that there are a few positions that can open after the Match. These are rare but it’s worth keeping an eye out for them! As mentioned above, your chances increase the more you know about what happens on this day, and about the VIRMP matching program in general. That’s why we created How to Navigate the Veterinary Matching Program. We want you to have as much information as possible about the Match and prepare accordingly. There’s no reason for you to repeat our mistakes, struggle to find information on the VIRMP website, and miss out on a great position! Make sure to check all our other posts on the Match here. We’re sure they will provide you with some insight for your application!